We have all you need for a weekend of fun with the family. Joe's Place, a member of the The Marina Association of Texas is a hill country, lake-front, gated facility hosting dry storage, water slips, moorings, 2 cement boat ramps, fishing, picnic and camp grounds, full hookup RV park, cabin rental, beach, swimming, party rental facility, and boat rentals. Park hours are 8:00 a.m. to dark Wednesday through Sunday with the exception of Friday and Saturday dock fishing until 10:00 p.m. Managers live on-site and are available in case of emergency. The park is closed Monday and Tuesday unless a holiday or pre-arranged special event. We reserve the right to close on extreme weather days for your safety. Our standard entry fee is $5 per person (no charge for children 7 and under), and our vehicle parking fee is $3. These fees do not apply to tenants, pass holders and boat launches. Pets are only permitted with the long-term RV contracts. Don't have a boat. No worries - rent one of ours. Just give us a call - we will reserve your private boat for the weekend. We also have boat launches and parking and dry storage area to park your boat. 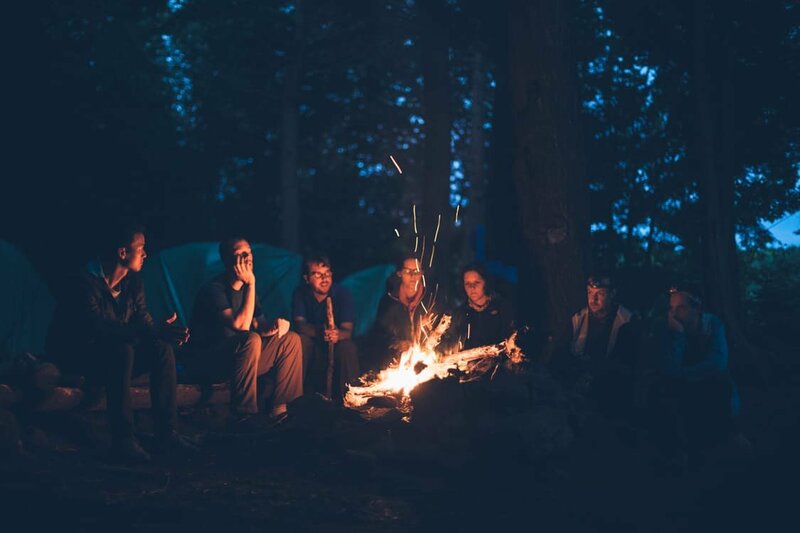 The weekend is always right around the corner and so is your next camping adventure. 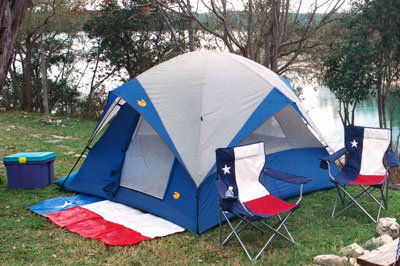 With lots of different type of camp sites, cabin rental and rv sites to choose from. 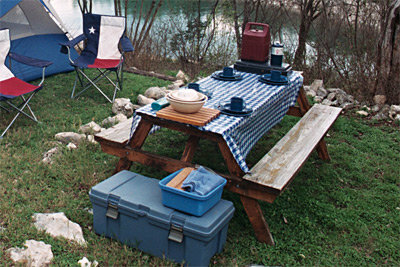 All campsites have a picnic table and a BBQ pit. The weekend is always right around the corner and so is your next fishing adventure. Spend the weekend and enjoy the beautiful Lake Medina. You can fish on a boat, on the shore or from our dock. You pick the perfect spot. All the necessiteis for a weekend packed with fun. From swimming in Lake Medina, to fishing, boating, camping, boat rental - we truly have all the activities to keep the entire family happy and creating memories. We bring families together and let the kids have fun and be just kids. There is too much to do near Lake Medina. From a day visit to San Antonio, to state parks or the zoo. We have made it easy and compiled a list of all the near by attractions to visit. Call us anytime to book a reservation. If you have questions - we would love to hear from you. Just contact us by email. Let us help you get your holiday started by giving us a call. Joe's Place Home About Activities Facilities Cabin Rental Boat Rentals Party Rentals Fees Park & Camping Rules Testimonials Contact Us/Our Info Weather Forecast | Weather Maps Testimonials Theses are just some of the testimonials we have received. If you would like to see some more, reload this page or click here. Your managers are doing a fantastic job! I moved here from Indiana and Medina was the first lake I went to. After meeting them, it didn't take me long to buy a year pass to Joe's Place and start bringing friends, family and my customers. Neat, clean and friendly! Two thumbs up! J.T. : “In condimentum facilisis porta sedec diam quisque eget odio"
I visited your marina for the first time on Labor Day and very much enjoyed your property and hospitality. I have a boat and would eventually like to rent a slip. Thank you again for the wonderful weekend. Seybold Family. : “Friendly hello and a smileo"
Joe's Place is very convenient for us, and it is great when you show up at the lake and are greeted with a friendly hello and a smile. The managers have really done a great job of upgrading the facilities, and they really care about the satisfaction and safety of the customers and their boats. Want the conforts of home and yet go to the lake for a family get away. We have the perfect solution. Rent a cabin and get all the comforts and privacy of home. Our cozy cabin is to accomodate your family and friends. Stay a weekend or a few weeks. The cabins have loads of amenities for the entire family to enjoy Joe's Place and all the activities we have to offer.